ticipating in new generation journal clubs which demands further observation. solutions to this is the establishment of electronic journal clubs. 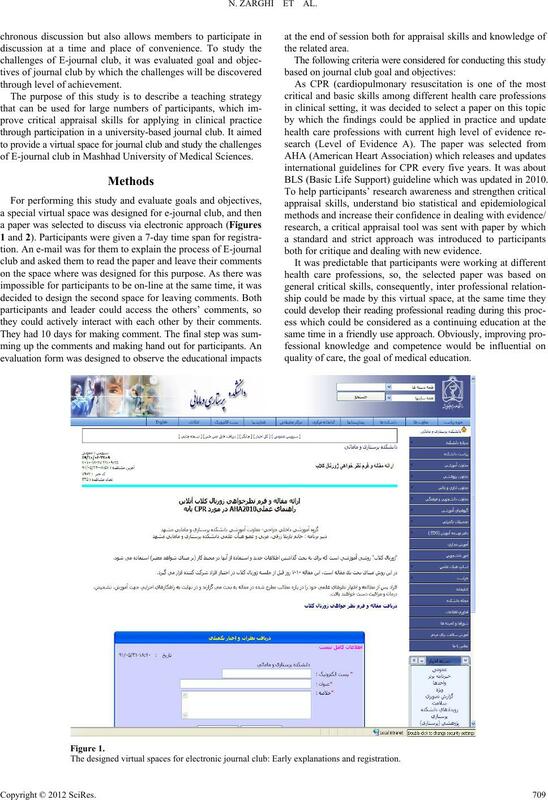 of E-journal club in Mashhad University of Medical Sciences. they could actively interact with each other by their comments. BLS (Basic Life Support) guideline which was updated in 2010.
both for critique and dealing with new evidence. quality of care, the goal of medical education. 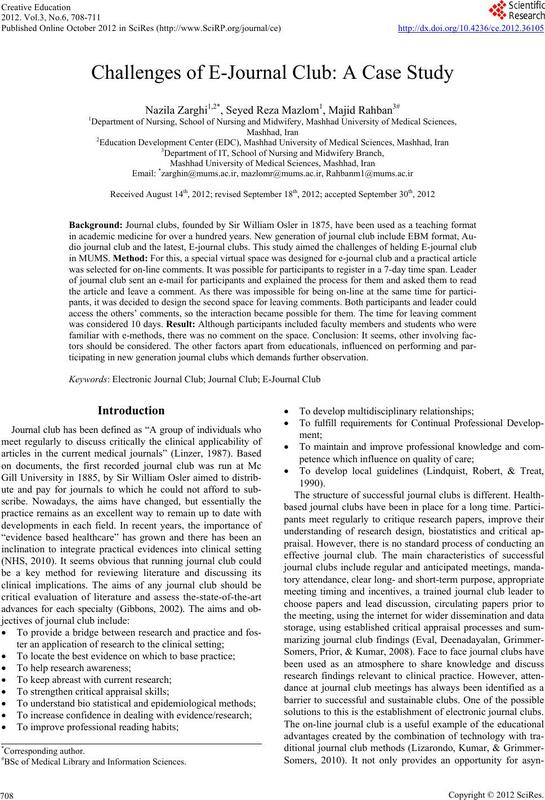 The designed virtual spaces for electronic journal club: Early explanations and registration. 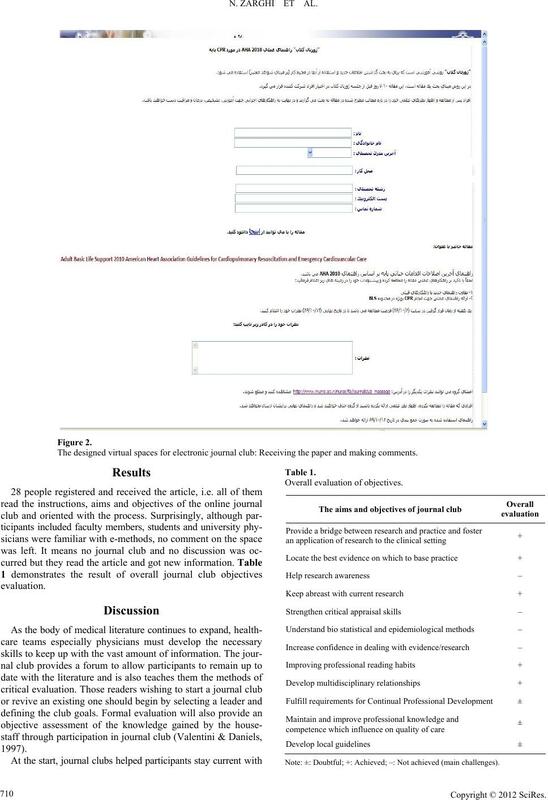 The designed virtual spaces for electronic journal club: Receiving the paper and making comments. Note: ±: Doubtful; +: Achieved; –: Not achieved (main challenges). Copyright © 2012 SciR es . undergraduate level (Akhund & Kadir, 2006). improving collegiality and communicating ne w lit erature as w e ll. often in a form that affects on their evaluations. knowledge and competence which influence on quality of care. wifery for their kind cooperation. country. B M C Medical E d uca ti on, 6, 43. S. (2008). How to run an effective journal club: A systematic review. on Critical Care, 17, 402-406.
tice. Journal of Allied Health, 39 , 17-22.